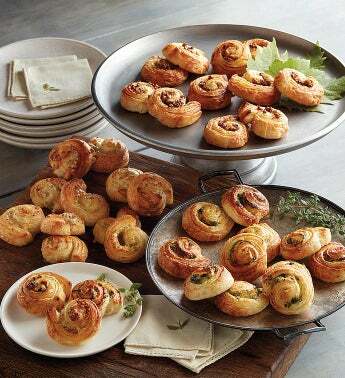 Entertaining is easy with this irresistible assortment of mini croissants in three mouthwatering flavors. There's tangy Grueyère, made with a blend of rosemary, pepper, and chives; rich spinach featuring béchamel, nutmeg, and Swiss Emmentaler cheese; and finally, savory mushroom, seasoned with shallots, rosemary, and thyme. Prepared in the traditional style using buttery dough that's carefully folded and shaped by hand, these appetizers arrive at your door ready to be thawed and baked.